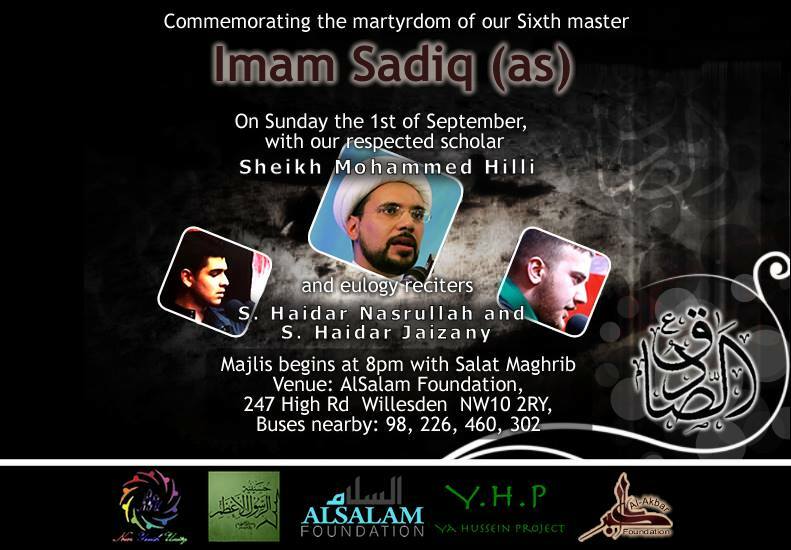 Commemorating the martyrdom of our sixth master Imam Jafar Al-Sadiq (as) on Sunday the 1st of September, with our respected scholar Sheikh Mohammed Al-Hilli (ha) and eulogy reciters S. Haidar Nasrullah and S. Haidar Jaizany. The Majlis will begin at 8pm with Salat Al-Maghrib. Venue: AlSalam Foundation, 247 High Rd, Wilesden, London, NW10 2RY. Buses nearby: 98 226 260 460 302. Food for blessings will be served.